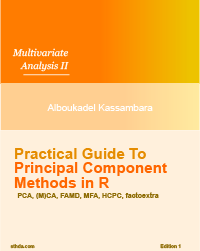 This R tutorial describes, step by step, how to build a 3D graphic using R software and the rgl package. 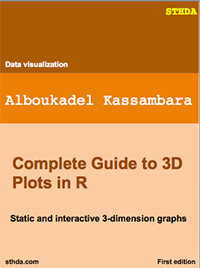 You’ll learn also how to create a movie of your 3D scene in R.
RGL is a 3D graphics package that produces a real-time interactive 3D plot. It allows to interactively rotate, zoom the graphics and select regions. The rgl package includes also a generic 3D interface named R3D. R3D is a collection of generic 3D objects and functions which are described at the end of this article. 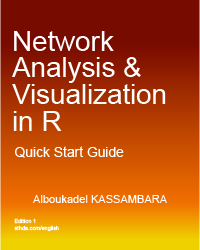 To make a 3D plot with RGL, you should first start the RGL device in R.
In the first sections of this tutorial, I’ll open a new RGL device for each plot. Note that, you don’t need to do the same thing. You can just use the function rgl.open() the first time –> then make your first 3D plot –> then use rgl.clear() to clear the scene –> and make a new plot again. x is a formula of form zvar ~ xvar + yvar (see ?xyz.coords). Ex: rgl.points( z ~ x + y). …: Material properties. See ?rgl.material for details. rgl.spheres() draws spheres with center (x, y, z) and radius r.
x is a formula of form zvar ~ xvar + yvar (see ?xyz.coords). Ex: rgl.spheres( z ~ x + y, r = 0.2). Note that, an rgl plot can be manually rotated by holding down on the mouse or touchpad. It can be also zoomed using the scroll wheel on a mouse or pressing ctrl + using the touchpad on a PC or two fingers (up or down) on a mac. rgl.viewpoint(theta, phi, fov, zoom): set up viewpoint. The arguments theta and phi are polar coordinates. In the R code above, I used the function rgl.viewpoint() to set automatically the viewpoint orientation and the zoom. As you already know, the RGL device is interactive and you can adjust the viewpoint and zoom the plot using your mouse. color: a vector of colors. The first color is used for the background color of the bounding box. The second color is used for the tick mark labels. The function rgl.lines(x, y = NULL, z = NULL, …) can be used to add axis lines. For the function rgl.lines(), the arguments x, y, and z are numeric vectors of length 2 (i.e, : x = c(x1,x2), y = c(y1, y2), z = c(z1, z2) ). The values x1, y1 and y3 are the 3D coordinates of the line starting point. The values x2, y2 and y3 corresponds to the 3D coordinates of the line ending point. Note also that, the argument x can be a matrix or a data frame containing, at least, 3 columns corresponding to the x, y and z coordinates, respectively. In this case, the argument y and z can be omitted. The function rgl.texts(x, y, z, text ) is used to add texts to an RGL plot. rgl.quads(x, y, z) is used to add planes. x, y and z are numeric vectors of length four specifying the coordinates of the four nodes of the quad. In the plot above, the bounding box is displayed as rectangle. All the coordinates are displayed at the same scale (iso-metric). The function aspect3d(x, y = NULL, z = NULL) can be used to set the apparent ratios of the x, y and z axes for the current plot. x, y and z are the ratio for x, y and z axes, respectively. x can be a vector of length 3, specifying the ratio for the 3 axes. If the ratios are (1, 1, 1), the bounding box will be displayed as a cube. Note that, the default display corresponds to the aspect “iso”: aspect3d(“iso”). scale: If x is a correlation matrix, then the standard deviations of each parameter can be given in the scale parameter. This defaults to c(1, 1, 1), so no rescaling will be done. centre: The center of the ellipse will be at this position. level: The confidence level of a confidence region. This is used to control the size of the ellipsoid. planes3d() and rgl.planes() draw planes using the parameter ax + by + cz + d = 0. Use the argument rgl.surface() to add a regression surface. axis: the desired axis of rotation. Default value is c(0, 0, 1). convert: If TRUE, tries to convert the frames to a single GIF movie. It uses ImageMagick for the image conversion. You should install ImageMagick (http://www.imagemagick.org/) to be able to create a movie from a list of png file. The functions rgl.select3d() or select3d() can be used to select 3-dimensional regions. They return a function f(x, y, z) which tests whether each of the points (x, y, z) is in the selected region. x is a matrix or a data frame containing at least 3 columns which will be used as the x, y and z coordinates. x is a formula of form zvar ~ xvar + yvar (see ?xyz.coords). The function identify3d(), works similarly to the identify function in base graphics. Use the right button to select, the middle button to quit. 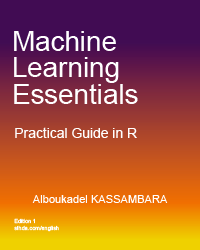 The rgl package also includes a higher level interface called r3d. This interface is designed to act more like classic 2D R graphics. 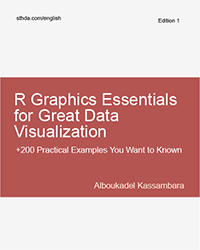 The next sections describe how to make 3D graphics using the R3D interface. For the default method: Allowed values are: ‘p’ for points, ‘s’ for spheres, ‘l’ for lines, ‘h’ for line segments from z = 0, and ‘n’ for nothing. box, axes: whether to draw a box and axes. Note that, it’s recommended to use the function open3d() to initialize the *3d interface. However, in the following R code chunks, I’ll continue to use the custom function rgl_init(). To remove the axes, use the argument axes = FALSE. Adds a shape node to the current scene. rgl.viewpoint(theta, phi, fov, zoom, …) Set the viewpoint orientation. theta and phi are the polar coordinates. fov is the field-of-view angle in degrees. zoom: zoom factor. rgl.postscript(“plot.pdf”,fmt=“pdf”) Saves the screenshot to a file in ps, eps, tex, pdf, svg or pgf format. Rgl.bringtotop(): ‘rgl.bringtotop’ brings the current RGL window to the front of the window stack (and gives it focus).